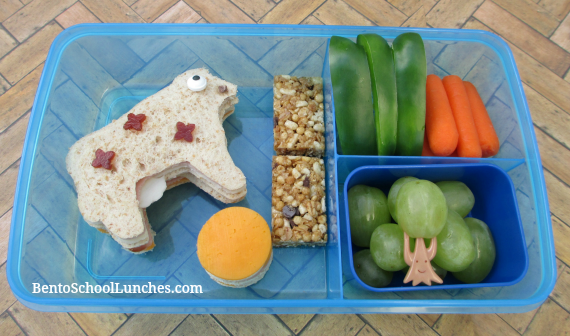 I created the cow from my Animal pals cookie cutter set, the moon from my circle cutter set, and packed this fun lunch in his Fit & Fresh container. Main section: Cow and Moon sandwiches. Moon topped with mild cheddar cheese (of course everyone knows the moon is made of cheese ;-) and the cow is decorated with provolone cheese, fruit leather, tiny chocolate chip and candy eye. Also in the main section I included a granola bar. Such a cute lunch, Rina. I love the cow's udder! This is so cute, I love this theme idea and your cow sandwich looks fab!